Kumain ka na ba ng Boodle? Subok na dito! 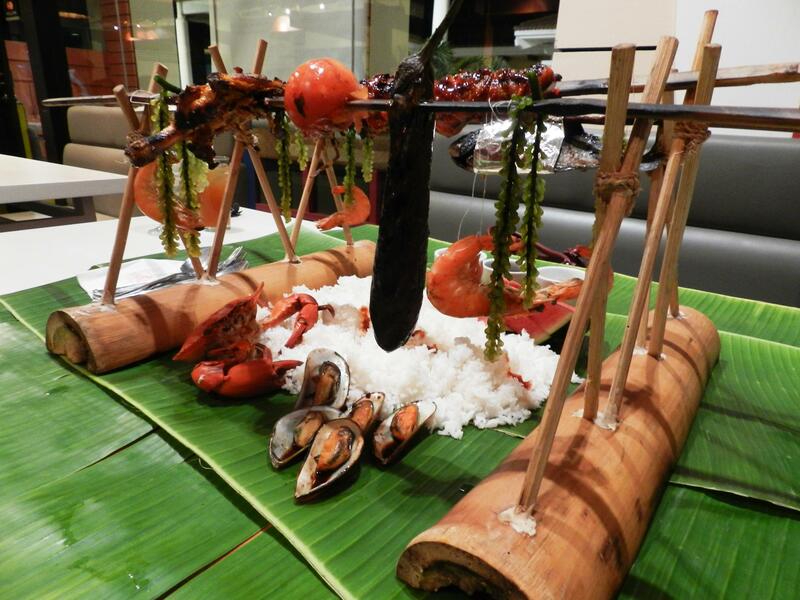 Finally there is a place in Alabang Town Center that serves seafood and barbecue favorites Boodle Style! Yes, Boodle Style! Blackbeard’s Seafood Island (by The Red Crab)—ATC’s new culinary haven that’s located at the 2nd floor of Corte de Las Palmas—far from a dampa or market setting where one would normally have to deal with the reeking smell of fish and people belting out at videoke machines. If you want to spend a quiet yet enjoyable meal with family or friends, Blackbeard’s Seafood Island is the place for you. Don’t worry about the price tag. Even though it’s located at ATC, amidst premium RTW shops and cinemas, Blackbeard’s Seafood Island boasts of a wide range of food items that are within budget. Yes, YOUR budget! Now let’s talk about boodle—Blackbeard’s preferred way of serving their specialties. Sure, many of the food items, like Sinigang na Bangus Belly (P320) and Kare-Kare Special (P435), are still served in bowls but to choose boodle is to experience seafood the way it should be in its full glory: all your favorite sea fare over a steaming pile of rice set on banana leaves. There is just no other way to enjoy it; certainly not on an elaborate table setting of expensive porcelains and silverware. The famous pirate Blackbeard would have none of that. And neither should any bona-fide seafood lover. Try the Tali Beach (P735 for three to four hungry eaters while P1,150 for five to six people), one of the restaurant’s best-selling Boodle Feast, and you’d know why such an unpretentious way of eating makes an enjoyable experience for the whole family. You’d come to realize why soldiers created the boodle concept to strengthen camaraderie. This is one experience all families should do once in their lives! It’s fun! And delicious too! Feel free to eat with your hands as well! True to its name, Blackbeard’s Seafood Island brims with creativity that’s as rich as the ocean itself. The place is always up with new promos. For their 7th anniversary (Sept. 14), they will be giving a whopping 70 percent discount on their Dapitan Boodle. This will apply to all of their 10 branches. 70 percent, people! If you want to test your limit, you might want to give it a shot. And oh, did I mention that Blackbeard’s boasts of a machine that brings beer to below zero temperature without freezing it over? Yup, they have that, exclusive to them. So, yes, you can hose down all that seafood and barbecue with a very cold beer (WE did!). If, however, you’re in the mood for some crustacean, gather family and friends and try Blackbeard’s crab-by-the-bucket promo. 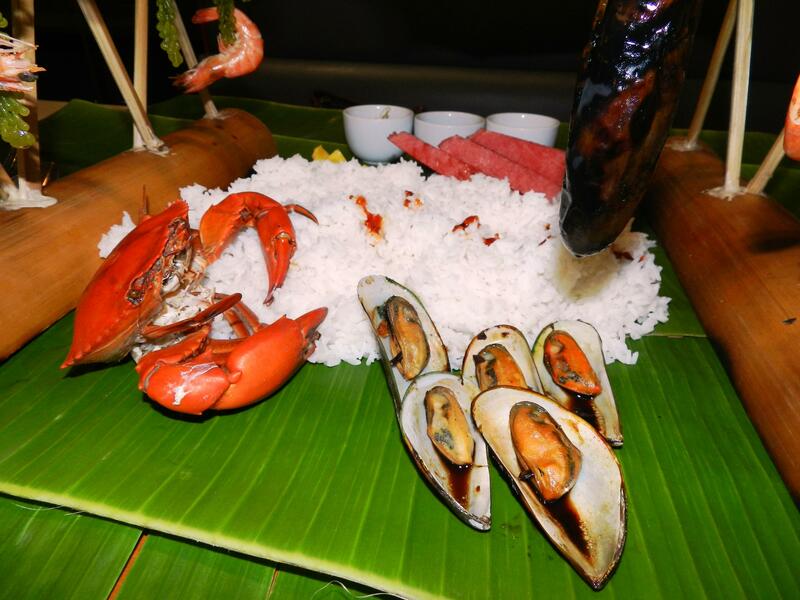 For a group of 20, just order five Boodle Feasts and get those crabs in a bucket! It’s a real snap! More than sharing a deep love for the seas, I know why Blackbeard’s Seafood Island was named after the 17th century pirate. Both are notorious. The pirate for his adventures and the restaurant for its great food and service. So, kumain ka na ba ng Boodle? What are you waiting for then? Next story Mom’s New Digital Playground from Drypers! Visit it now! Previous story Check out the winners of the John Robert Powers Promo here! Congrats!